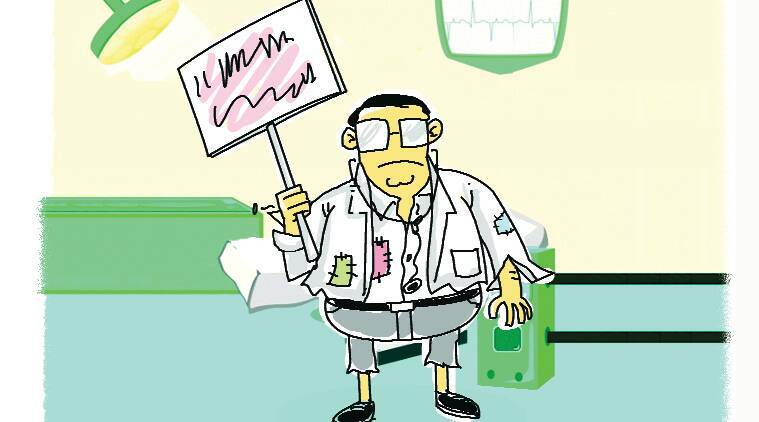 One demand of doctors who went on strike in Delhi last week was for shorter duty hours. They are unregulated currently, and resident doctors in the capital’s public hospitals easily end up working 36-48-hour shifts. (See the Page 1 report in this paper’s July 7 edition.) In Emergency wards of private hospitals by contrast, doctors work, at the most, 8-10 hours at a stretch — and treat, by conservative estimates, about a tenth the number of patients at a government hospital Emergency. Senior consultants or teaching professors are usually never on duty during Emergency hours in government hospitals. After 5 or 6 pm, Emergencies, Emergency operation theatres, and wards — often with two of three patients sharing a bed — and ICUs are left entirely to the resident doctors. Rules say consultants must report to hospitals in grave emergencies, but rare is the day when a senior consultant is seen in a hospital after midnight. In private hospitals, consultants are on duty in ICUs and surgical wards through the night. Residents also juggle what should ideally be discrete duties. So, a resident in Anaesthesia posted at an ICU may have to handle emergency surgery, leaving the ICU to juniors or interns. And if a patient in a ward starts to collapse, the same resident may be asked to rush there. What is the impact of putting in insanely long hours in a high-pressure environment on the resident doctors and their patients? While Indian research is scant, a landmark study published in the New England Journal of Medicine (NEJM) in 2005 produced alarming findings. The study by the Harvard Work Hours, Health and Safety Group found that resident doctors made 35.9 per cent more serious errors when working 24 hours-or-more schedules, compared to “every third night” call schedules. The study, based on 17,000 Internet questionnaires answered by over 2,700 doctors in their first year of post-graduate residency, also found that every time their work shifts overshot stipulated hours in a month, their risk of suffering a motor vehicle crash increased by 9.1 per cent, and the monthly risk of a crash during the commute from work to home by 16.2 per cent. In months with five or more extended shifts, “the risk that they would fall asleep while driving or while stopped in traffic was significantly increased” — by ratios of 2.39 and 3.69 respectively, the study found. Another 2006 multi-institutional study published in the Journal of American Medical Association (JAMA) by the Harvard Medical School and Vancouver General Hospital, found accidental percutaneous injuries — needlestick or laceration injuries — common in residents who worked 24 hours. “Lapse in concentration and fatigue were the two most commonly reported contributing factors (64% and 31% of injuries, respectively),” the study noted. Needlestick pricks expose doctors to blood infections, which may be life-threatening, like HIV and HCV. A third multi-institutional study, by the Kansas City School of Medicine, published in the journal Academic Emergency Medicine in 2008, found 8 per cent resident doctors posted in Trauma or Emergencies saw 96 motor vehicle crashes, and 58 per cent doctors reported 1,446 near crash injuries after duty hours. Nearly three-fourths of motor vehicle crashes and 80 per cent of near-crashes followed the night shift, according to the study. In 2006, a study of gynaecology residents by Northwestern University’s Feinberg School of Medicine, published in the American Journal of Obstetrics and Gynecology, found 89.8 per cent “showed evidence of moderate burnout” and 34.2 per cent were “considered depressed”. In the West, rules regulating work hours of junior doctors have been in place for the last 10-15 years. Studies in the United States have already quantified improvements in patient care, including significant reductions in mortality. In the UK, working hours for junior doctors are limited by the European Working Time Directive. A doctor can now work an average 48 hours per week (from the earlier 56 hours), calculated over 26 weeks. After continuous duty of 11 hours, a rest day is prescribed. A day off is mandated every week, and a 20-minute rest every 6 hours. Dr Soumyadeep Bhaumik, Executive Editor, Journal of Family Medicine & Primary Care, says the US-based Accreditation Council for Graduate Medical Education has recognised long work hours as a safety hazard for interns. “The nation simply cannot afford to lose young doctors due to faulty regulations in place. The results of these studies have implications for medical residency programmes, which routinely schedule physicians to work more than 24 consecutive hours,” Dr Bhaumik said. Bodies of senior doctors in India, like the IMA or state councils, have rarely raised the issue of duty hours for junior doctors. The British Medical Association, by contrast had, in 2013-14, campaigned against the violations of these rules in the UK.